The official ‘stories’ all called for considerable adjusting because of the premature death of Sathya Sai Baba in 2011! None of the various conflicting predictions Sathya Sai Baba made as to his lifespan (i.e. from 92 to 96 years of age) held up. This failure threw into disarray all the predictions Baba made of the time frames to his return in the incarnation as Prema Sai Baba. Not surprising to those who know the manipulations of fact and faulty propaganda spread by Sai Baba and all his various institutions through the decades. At his unexpected death, disappointed officials and zealots made the specious claim that Sai Baba DID live to be 96 if one reckons in terms of lunar years. However, none of the calculations based on lunar months (as opposed to calendar months) agreed with any of the various dates he had predicted. Nor does the lunar theory fit with what he clearly stated in 1960 “I will be in this mortal form for 59 years” and in 1961 “I shall be in this body for 58 years more“. (Sathya Sai Speaks Vol. I – p 198 & Vol 2 – p. 92). 1:05: It’s been four years since Sathya Sai Baba took his last breath; this boy was born over a year after he left the body. People are worshipping the feet of this boy. What is really happening here? What is this devotion and happenings? Where is this happening? 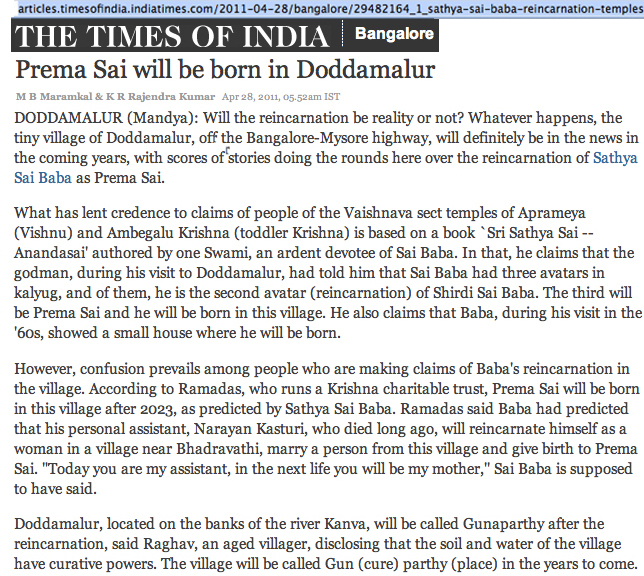 Was Sathya Sai born again, is Prema Sai born again? 2:14, Lady commentator comes on and says basically what is written above. (Scenes of the village) This is a village in Karnataka. Beautiful village, peaceful minds (etc). 3:02, A villager talks about how five people came from Manipur to their village and went house to house searching. (Commentator:) They searched for about two and a half months. They carefully looked at each small child. Villagers had doubt and even wondered if they wanted to kidnap a child. They finally asked the group what they were doing. 3:47, They group from Manipur said their guru told them to come to this village and search, because Sathya Sai was born again. 5:59, One of the Manipur guys speaks in Hindi about searching for Prema Sai. Commentator: The boy fulfilled all the tests that the Manipur guru asked them to perform on young boys in the village.